Life can get crazy busy, really fast. I am currently feeling the pressure of a rapidly growing to-do list and while life is good, the challenges are proving well,…challenging. Even when things get hectic and we don’t know when we’re going to catch a break, busyness does requires some balance. We can’t go at a constant 110mph without burnout. Rest assured, if you don’t establish balanced habits, there will be casualties. That’s why there needs to be some in-between time tucked here and there to slow down, recharge, regroup and collect our sanity. This post contains affiliate links. View disclosure here. This would be my number one, book nerd that I am! But seriously, research shows that reading is a great way to relax. And I’m not talking about something highly analytical. Read something for fun! Or maybe you read highly analytical stuff for fun…Well, whatever you consider enjoyable and relaxing, read that! I’m not anti-video games but, truth be told, I wouldn’t much miss them if I never saw another one as long as I live (except maybe Mario Kart cause I’m kind of a sucker for Mario Kart :P). So when I say game, I’m talking good ol’ fashioned boards, cards, dice, spinners and instructions that take 20 minutes to figure out. Taboo, Monopoly, Risk, Boggle (one of my fam’s faves), Pictionary, Scategories, Dutch Blitz (our all-time fave card game) you name it! Get your favorite people together, take a load off and have some fun! The art and habit of letter writing isn’t as common as it used to be. But it’s not dead and just like physical books, I don’t think it’s in danger of dying. There are plenty of people who still write letters. You can even join the Letter Writers Alliance, an online society that is dedicated to keeping this tradition alive! Writing a letter doesn’t cost much, just a stamp and some time to put your thoughts on paper. Ah, yes–time! Take a few minutes to indulge in some real text messaging. Take 15 minutes and just shut down. The car, the couch, your bed, if you’re lucky. Steal away and take a snooze and then pick up where you left off! Make your morning or afternoon mellow with classical tunes. Classical music is soothing and will brighten your mood or ease your tension. If you’re feeling frazzled and like you can’t catch up with the craziness around you, keep calm and listen to Beethoven. I’m a firm believer in hobbies. Everyone needs something they can go to exercise their creativity and give dreams a place to play. Some people play instruments. Some cook. Some go fishing. Some paint pictures. Some scrapbook. Some have a combination of several things. Whatever your creative outlet is, give it a space in your busy schedule and don’t miss out on the things that put a smile on your face and keep your brain happy. We live in a microwaved society. These days you don’t have to know how to cook much because food can be put in the microwave, poured out of a bag, shoved in the oven, called in, or picked up at a window. But if you find yourself too busy to cook every so often, you might need to slow it down and take out your pan or casserole dish. Taking time to cook a meal is not only the healthier choice, it can also be a good way to interact with your family, reflect on the day, think through problems, or just escape the craziness. If the weather permits, get some fresh air and go for a stroll. Walking outdoors is a great way to clear your mind and get your thoughts in order. Not to mention the added health benefits and the inevitable need for a tall, refreshing glass of water afterwards! Journaling is not just a great way to press pause on life, it’s also a great way to clear your ind and organize your thoughts and ideas. This is one of my latest re-gained habits and I’m not exaggerating when I say it’s seriously one of the best things I will have done this year. No joke. And remember, a journal isn’t like a diary where you spill your guts and emotions. I can be if you want but it most definitely doesn’t have to be! It’s a great place to write lists, sketch out ideas, jot down random thoughts that don’t quite yet have a place anywhere else. Seriously, 10-15 minutes and see how re-charged you’ll feel after getting some of your brain onto paper! You don’t need to say yes to everything. One of the best ways to slow down is to be mindful of what you can realistically fit on your calendar without sacrificing the health and sanity of yourself and your family. That means sometimes saying no to good things. Not all good things are beneficial or necessary right now or in this season. In the words of the apostle Paul, “all things are lawful for me, but all things are not expedient,” (1 Corinthians 10:23). It’s okay to say no. Sometimes, it’s the best choice you can make. I will be the first one to say this to myself: Put Your Phone Down. I know I’m just as guilty of this as the next person but do you notice how many face-to-face conversations we have with our phone in our hands or, worse still, with our faces in our phones? Most of us can remember the days when phones were hung up in cradles on the wall or side table. We did function without smartphones once upon a time so I know it’s possible to do so now for at least an afternoon or evening. Instagram can wait. Nobody’s going to get mad at you if you don’t check your FB feed again (and if they do, you need to find some new friends). YouTube will still be there when you get back. Tweets don’t expire and your email and texts will be ready for you to open at a later time. We’re all busy and we’re all connected and that’s great but at some point, you gotta put it down for awhile and interact with what’s going on right in front of you, in the flesh, face to face. One day your kiddo won’t want to play catch with you. One day your friend might move away to pursue another chapter in life. One day your significant other may decide that someone else has more time for them. You don’t want to look up one day and find that you missed it all. What are some of the ways you take it slow? 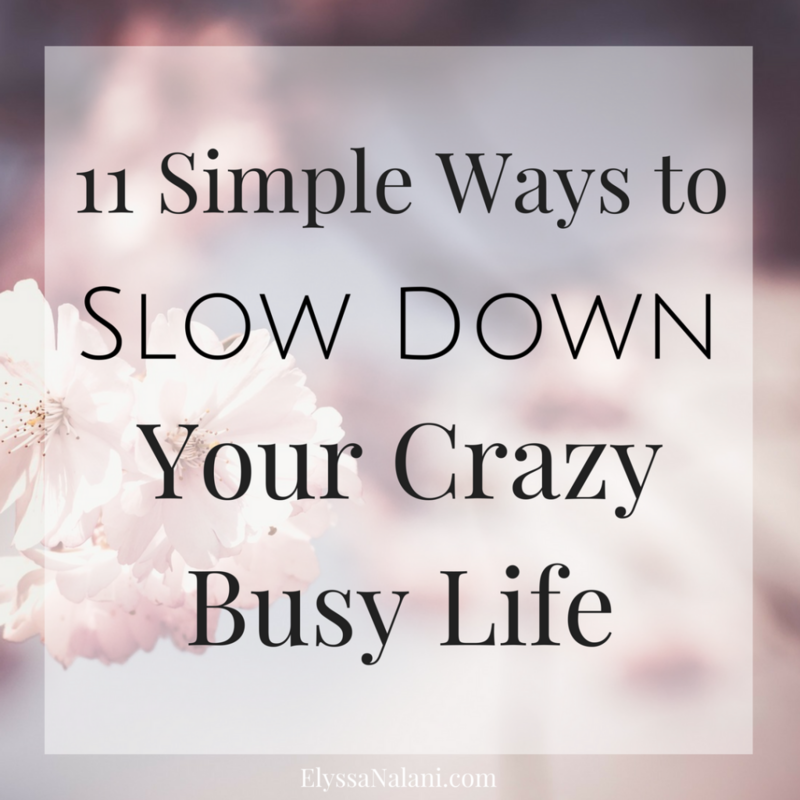 Do you need to make commitments to be more intentional about slowing down your busyness? Why do you think it’s so hard to stop sometimes?